Dental implants are artificial, titanium tooth roots gently placed in the jawbone. Bone around the implant fuses to the titanium root through a process called osseointegration, and once healing is complete, a dental crown, bridge, denture, or full arch restoration is secured to the implant post(s). Because dental implants replace the tooth root and crown, they are the most natural-looking and functioning replacement for a missing tooth. Dr. Deb and Dr. Rob are expertly trained to complete all phases of your dental implant surgery here at Bethesda Sedation Dentistry, eliminating the need to visit other dental offices for the various phases of treatment. From the initial stages of planning to the final fitting of the restoration, you can expect an unmatched level of care that results in a beautiful smile transformation. Are There Candidacy Requirements for Dental Implants? In addition to needing one or more missing or damaged teeth replaced, patients must have satisfactory oral health and enough jawbone density to support the implant post(s) to be considered candidates for dental implants. Fortunately, the Hybridge® implant solutions offered by Dr. Rob and Dr. Deb use bone tissue that many people still have despite bone deterioration after tooth loss, which significantly increases the number of individuals who qualify as good candidates at our practice. Furthermore, if it is determined that you are not initially an ideal candidate due to poor oral wellness or insufficient jawbone density, our dentists can perform periodontal care, tooth extraction(s), bone grafting, and/or various other services that can help make you more qualified for the procedure. What Are My Tooth Replacement Solutions with Dental Implants? Dental implants can be used to replace one tooth, several teeth, or all of your teeth. The following information can help you determine which tooth replacement solution may be best for your specific needs and desires. Single dental implants can be a great option for replacing individual teeth. Each implant is carefully inserted into the jawbone in the space left by the missing or extracted tooth, and a dental crown is custom-fabricated to match the size, shape, and color of the natural teeth on either side. Multiple dental implants will typically be the best solution for replacing three or more consecutive teeth. With this option, anywhere from two to six implant posts are used to secure a single restoration (such as a dental bridge, partial denture, or full arch) that spans the entirety of the gap left by the absent teeth. The total number of implants needed will be determined by your bone density and how many teeth the restoration is being used to replace. Overdentures—also called implant-supported dentures—refer to upper and/or lower dentures that are fixed in place with dental implants. As opposed to traditional dentures that can slip or shift along the gumline, this advanced technique affixes your dentures to your jawbone via two implants, enabling them to look, feel, and function more like natural teeth. At our practice, we use the Hybridge® Overdenture for both upper and lower arch tooth restoration. Full mouth reconstruction is generally necessary when all (or virtually all) teeth need to be replaced. For the upper row of teeth, a total of five or six dental implants are inserted along the jawbone, and a customized Upper Hybridge® Full Arch Dental Implant Restoration containing 12 teeth is secured. Similarly, five to six implants are strategically placed along the lower jawbone, and a Lower Hybridge® Full Arch containing 12 teeth is fixed in position. In addition to restoring teeth, these Hybridge® Full Archs also replace the gumline for an even more natural look and feel. To learn more, please visit our page on full mouth reconstruction. Candidacy: Many women and men who have been told they are not good candidates for traditional dental implants are eligible for Hybridge® implants. This is because the Hybridge® process uses bone that most individuals still possess despite bone loss, whereas more conventional methods require patients to have minimal to no bone deterioration at all—which is often not the case for people with missing teeth. Materials: Most traditional dental implant posts are made from titanium, and the tooth restoration secured on top is generally composed of porcelain. 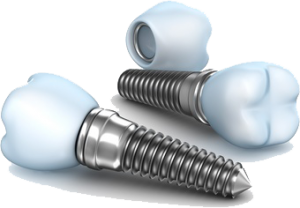 In contrast, Hybridge® implants are fabricated from an incredibly strong chrome cobalt material, and the prosthetic restoration is formed using cross-linked PMMA and pink acrylic material. The result is an exceptionally natural tooth and gum tissue appearance. Treatment Time: The total treatment time for both regular dental implants and Hybridge® implants will be influenced by several different factors, including whether tooth extraction and/or bone grafting is necessary, the location of the missing tooth or teeth, and if any oral infections are present initially. On average, however, the Hybridge® process can normally be completed in less time than traditional dental implant methods—all without sacrificing safety, durability, or aesthetics. Providers: While conventional dental implant procedures are performed by a wide range of dental professionals, only dentists who have completed extensive training and achieved certification through Hybridge, LLC can offer Hybridge® dental implants. To be qualified for this training program, dentists must already be considered leaders in all aspects of implant dentistry. For more information about what sets Hybridge® apart from conventional dental implant methods, please contact our office to schedule an appointment. To begin the dental implant process, Dr. Rob or Dr. Deb will first meet with you to perform an extensive oral evaluation. The purpose of this examination is to determine whether or not you have an adequate amount of jawbone density to safely and effectively support one or multiple implants. If it is decided that you are a good candidate, your dentist can proceed with planning the surgical phase of treatment using our 3Shape TRIOS® system, which aids in determining the ideal location(s) for implant placement to help ensure optimal success. If you are not qualified for the implant procedure, they may suggest an option such as bone grafting to help improve your jawbone density, or they might recommend a potential alternative treatment. At the time of implant surgery, Dr. Deb or Dr. Rob will meticulously insert the implant(s) through the gum tissue and into the jawbone in the designated area(s). Once placed, the titanium implant post(s) will need to fuse to the bone over the course of a few months. During this time, a temporary restoration can be attached to the tip of the implant(s) until the fusion is complete. When this occurs, each implant is officially a permanent part of your mouth, and your customized crown, bridge, overdenture, or full arch can be secured in place by your dentist. The final result is a beautiful, natural-looking and feeling restoration that improves both the appearance and function of your teeth. Once fused to the jawbone, the dental implants themselves become a permanent part of the mouth, assuming they are properly cared for following treatment. This includes regular brushing and flossing, as well as receiving professional dental cleanings at least twice annually. The restoration placed on top of the implant(s) can also be long-lasting when ideal oral hygiene habits are maintained, often lasting years—and potentially decades. In general, dental implants are considered a safe tooth replacement solution, having been used in restorative dentistry for decades. Like any surgery, however, there are risks associated with the procedure, making it imperative that you choose a dentist who is highly qualified and experienced in all phases of treatment. This includes surgical planning, implant placement, final restoration design/attachment, and aftercare. At the time of your consultation, Dr. Deb or Dr. Rob can discuss all potential complications with you, as well as the various techniques and preventative measures they employ to maximize the safety and overall efficacy of treatment. At our practice, most patients do not experience pain or discomfort during dental implant surgery thanks to sedation dentistry. With options such as oral sedation, nitrous oxide, and IV sedation, Dr. Rob and Dr. Deb are able to perform treatment while you remain in a completely relaxed and comfortable state. Following the procedure, some degree of soreness and discomfort is common, though these symptoms can typically be alleviated via medication until they fully resolve on their own. When choosing a dental implant provider, it is important to keep in mind that cost is often a reflection of the skill and experience of the dentist, as well as the quality of materials and technology used. To obtain a personalized quote for the price of dental implants, we encourage you to schedule a consultation with one of our dentists. After performing an extensive assessment of your unique needs and smile goals, Dr. Rob or Dr. Deb can provide a close estimate of what you can expect your dental implant treatment to cost. If desired, our team can also help you explore various dental financing options that can make your dream smile an affordable reality. Are There Any Dental Implant Alternatives If I’m Not a Candidate? For individuals who are not good candidates for dental implants, Bethesda Sedation Dentistry offers a number of alternative tooth replacement options, including traditional crowns and bridges. In addition, tooth-colored fillings can sometimes be used to help restore teeth affected by damage or decay when extraction is not required. During an appointment at our office, Dr. Rob or Dr. Deb can help you determine the most effective tooth restoration options for your unique needs. Dr. Deb and Dr. Rob will determine the answer to this question during your treatment planning. They can place one dental implant for a single tooth restoration or several implants to secure a prosthetic. Your bone density and other factors will dictate how many implants are necessary. Placing enough implants is critical to the long-term success of the restoration. Once in place, implants look, feel, and function like natural teeth, and you should care for them as such. Although dental implants will not decay, regular brushing and flossing is vital to keeping the surrounding gum tissue healthy. How do I find the best implant dentist? When getting dental implants, you should select a dentist or dental team with in-depth knowledge and prior experience in all aspects of the treatment. At Bethesda Sedation Dentistry, our dentists and staff have this expertise. It is also important to know that implant treatment consists of two components: a surgical phase and a restorative phase. Dr. Deb and Dr. Rob are trained and experienced in both phases of care. For more information about dental implants, or if you are interested in scheduling an appointment at our practice, please feel free to contact us today.